A brand new school is opening and it is time to elect the school mascot! Students can choose the Eagle, Lion, Bear, or Wolf. Voting results can be displayed in a table, tally chart, pictograph, bar graph, circle graph, or dot plot. 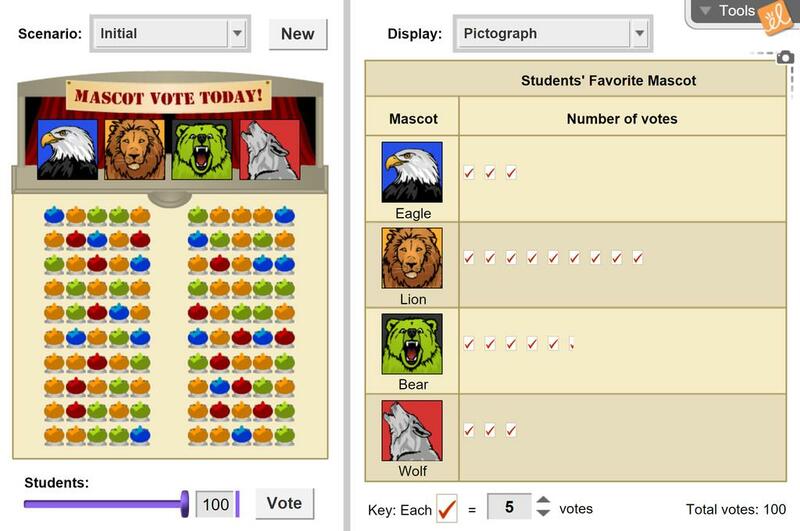 You can change student votes by selecting a group of students and clicking a mascot. Read and interpret data in frequency tables, tally charts, pictographs, and bar graphs. State the relationship between pictographs and bar graphs. Choose an appropriate scale to display data on a pictograph and bar graph.